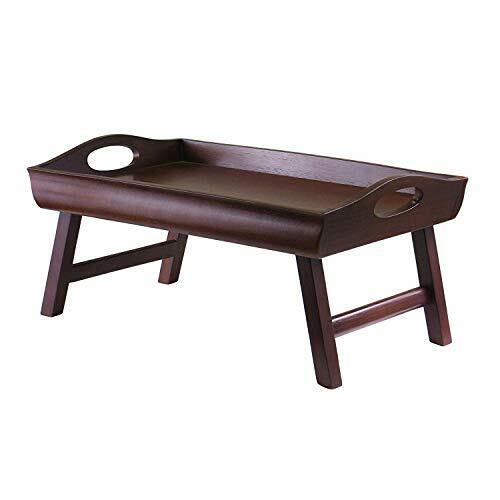 Winsome Wood's Bedtray with handles and folding legs makes it easy serve with and store when not in use. The natural finish on the solid wood legs and frame make it a sturdy serving piece. The legs can be folded for use as a serving tray. The white melamine serving surface is functional for serving and easy to clean with a damp cloth. Add an elegant touch of bamboo style to your home interior with this classy serving tray. This tray can be used either as a server or a decoration holder. Whether it's breakfast, appetizers, or wine glasses, spoil your guests by serving them with this platter. Or, show off your favorite candles, keepsakes and more on its smooth surface or simply use it as a laptop desk, bed table, etc. Bring sophisticated bamboo design to your life with this convenient and stylish serving tray. Traditional bed tray with a design twist. Finished in warm antique walnut and made from solid/composite wood. Large handles and folding legs for easy storage. Serve your favorite breakfast on this great tray. Limited time - Backed by FREE LIFETIME GUARANTEE Home-it Bed tray is ideal for breakfast in bed or tv dinners. It folds for easy storage and cleaning. Constructed of a sleek bamboo finish to ensure durability and stability. Bed Tray with built in upright handle. Foldable Leg. White melamie top for easy cleaning. The tray table is top quality and best workmanship. You can use it on the sofa and bed for a laptop table, also the tray for the breakfast and fruits. HOMFA always try the best to offer the top quality item and service, if you choose us, we must give you a nice experience. BEAUTIFUL AND HEALTH-The tray table is made of the natural bamboo, more beautiful and health. WEIGHT IS LIGHT-The tray table is very light, you can easily move and carry it. EASY TO CLEAN-You only need a wet towel when you want to clean it. 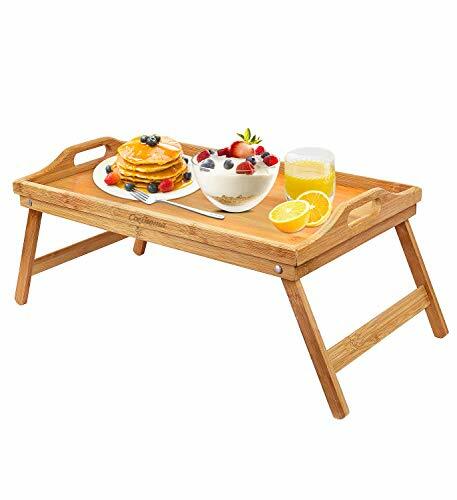 ALL-PURPOSE The breakfast tray is designed with 4 foldable legs. It all depends on you whether you want it to be served as a breakfast/coffee/fruits table, laptop desk or bed/sofa table in living room, kitchen, bed room and hospital. The serving tray table can be carried wherever you want without any effort because it's very light and with the two hollowed out handles. So it's quite convenient for your daily activity, for example, going camp, eating breakfast in bed, serving guests with some drinking/snacks/fruits, working with your computer on sofa and so on. NATURAL BAMBOO The tray table is made of 100% premium natural bamboo which is known as eco-friendly, healthy, durable, light and beautiful. Bamboo is the best material for furniture related to eating. SAVE YOUR SPACE The tray table with its folding feature could save lot of the space of you to store just by putting their legs away. EASY TO CLEAN If you get the table dirty, you can easy to clean it with wet towel and then dry thoroughly. Bamboo Breakfast Tray gives you brand new life experience. Having a pleasant breakfast with your lover after adequate sleep, start a wonderful day. it's also convenient for patients to have nutritious meal. 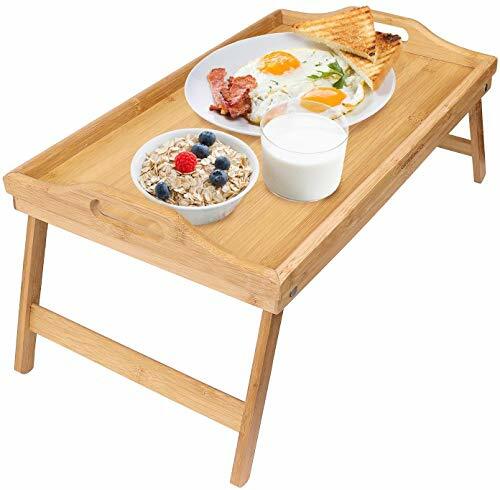 -Breakfast tray with smooth surface works for serving breakfast, eating or working in bed and etc. -Portable size you can take it anyplace in your home. -Natural Eco-friendly bamboo, high quality, and sturdy bamboo material, durable and firm.to grow mature. -The table is adjustable and is parallel to the horizontal plane to protect your vision and cervical spine better. -The Serving Tray is made of bamboo which keeps your food clean and safe. -Foldable and adjustable. Surrounding tray lips prevent items from falling over. If you have any problem with life such as cooking or decoration of your home, You can contact us, we can send recipes or Decoration manual for you. Eco-friendly material: Made of bamboo. (natural antibacterial and anti-mite). No insecticide, herbicide, with natural bamboo scent. Muti-Functional: Ideal for serving breakfast, dinner Can be work as breakfast tray bed tray laptop desk. Carrying handles for easy to carry to indoor& outdoor. this table tray can widely use in kitchen bedroom bed sofa and hospital etc. Save space & Prevent leakage: Foldable legs and two hollowed out handles for easy carrying. Surrounding tray lips prevent items from falling over. No need to worry any liquid will spill out of breakfast tray to get your clothes or sheet dirty. Tray maintain: easy to clean, in order to extend the service life of this breakfast tray, it would be better to not soak it in water, just use wet towel to wipe it. Warranty: Let every customer 100% satisfaction is our constant pursuit If you have any problem or unsatisfied Please tell us, we will response you and solve this problem as soon as possible, make sure you have a pleasant shopping experience. 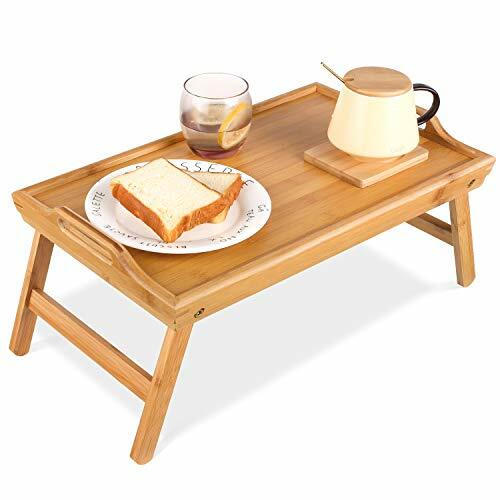 Gourmex Bamboo Foldable Tray, Use as Lap Desk, Breakfast Bed Table, TV, Computer Tray. Great for Snack, Drink, Study in Bed, Couch, Floor, In or Outdoor. With Handles and Folding Legs. Be it midwinter vacation or a lazy summer morning, breakfast in bed is a treat not to be messed with. When done properly, the experience is one you don't forget so fast. Here at GOURMEX we have brought to you the perfect tray. 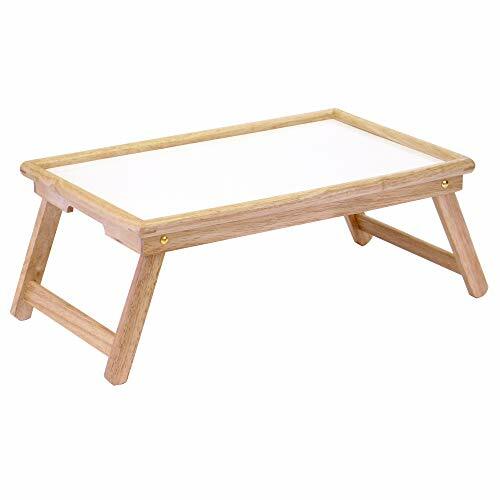 Made of Bamboo wood with foldable handles and legs, this tray will serve you many purposes. Use it as a desk for your laptop, a tray for your food and drinks, a table for your TV or anything else you need. 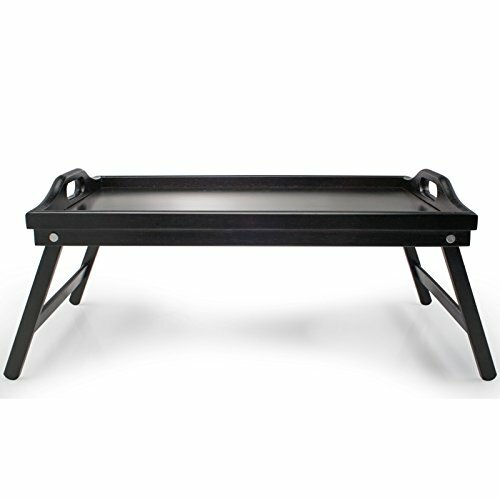 This tray works well in bed, on the couch or sofa, in your hammock or on your lawn chair. With endless options available, this tray is definitely worth investing in when looking to keep dinner crumbs and work papers safely out of your blankets and throw pillows. BREAKFAST IN BED - Love your breakfast in bed on Saturdays? 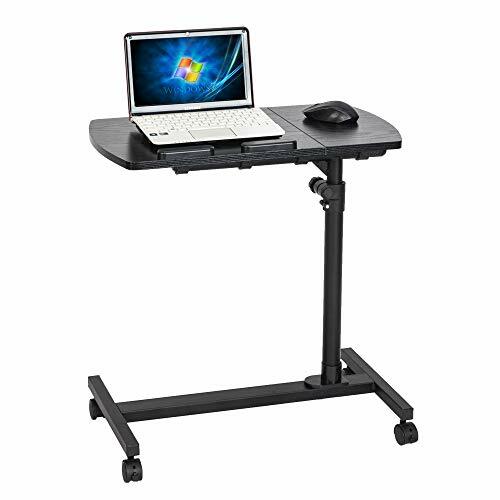 Looking for a laptop table for bed when working? Fed up with dirty couches while eating in front of the TV? 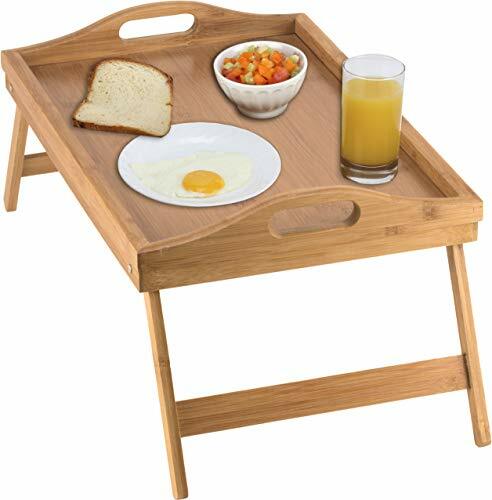 This perfectly sized bamboo breakfast tray will solve it all for adults and kids alike. With enough room for your legs underneath and your entire meal above, you'll relish every moment of use. FOLDING LEGS: Equipped with folding legs, this tray allows you to pop it up to create a standing table. When not in use, the foldable table tray takes up minimal space making it easy to store. Each lightweight bed table is equipped with hollowed out handles providing simple and efficient means of transporting it. MULTI-FUNCTIONAL: Equipped with handles for easy carrying indoor and outdoor, this table tray can be widely used at home, kitchen and hospital etc. Add an elegant touch of bamboo to your home with this classic serving tray. This tray can be used either as a server or a decorative holder. CONVENIENT SIZE: Open Dimensions: 19 x 11.75 x8.25 Inch. These tray tables will definitely come in handy for you and your family members at home, in any room, bedroom or dining room. Perfectly sized to hold your meals, TV or work, you will enjoy the table for a multitude of tasks and events. EASY MAINTENANCE: This bamboo tray cleans super easily with water and mild soap. Wash carefully with a soft cloth and then dry thoroughly. Do not soak. For extended tray life, use bamboo oil occasionally. When you get up, bathe in the sun, watch TV, and have breakfast on this trays, what a happy thing, whether it's on the bed or on the floor mat. 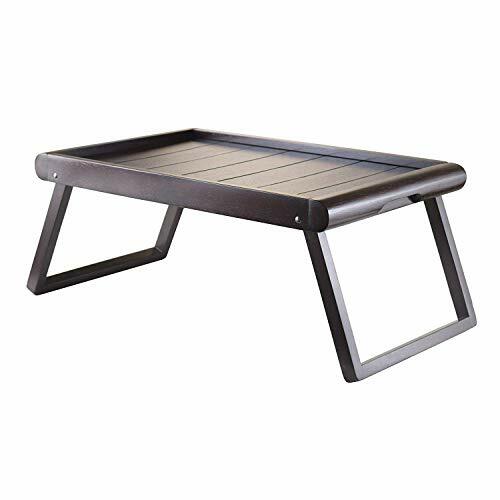 Or when you want to eat fruit or use your laptop when the weather is cold or the ground is not clean, this bed tray table is your best choice. You can fold it up to save space when you don't use the tray. Lightweight desgin and foldable legs will make you easy to carry where you want. 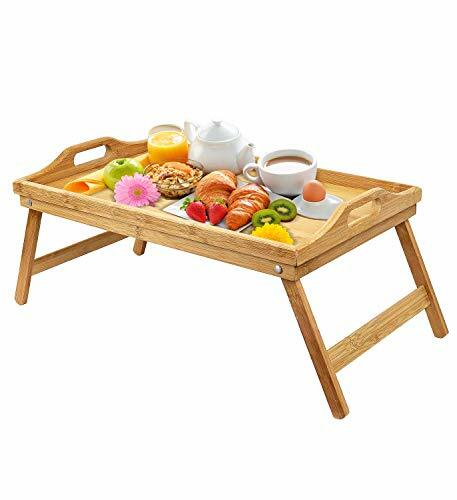 NATURAL BAMBOO This breakfast trays is made of natural bamboo and it is eco-friendly material. This makes it sturdy & durable and with natural bamboo scent. LIGHTWEIGHT & PORTABLE The tray weight is only 2.1 pounds and lighter than others. Lightweight desgin can make you easy to carry wherever you want. 4 foldable legs will save space when not in used. This is a best choice for your daily activities. HUMANIZE DIMENSIONS Compared to other trays, our trays are humanize size design, they are larger and the folding height is smaller. Platform size 20 L x 12'' W, 9.25'' H when standing, 2.36'' H when folding. FRIENDLY DESIGN 2 exquisite hollowed out handles makes the serving trays easy to move when you using it. Surrounding trays lips can prevent your items from sliding down. MULTIFUNCTION You can used serving bed trays in a variety of settings, like bedroom, living room, kitchen and hospital. And you will do a lot of things on it, like eating breakfast or fruit; drinking coffee or beer; working with your laptop, writing or reading. Buy now, it's in front of you.